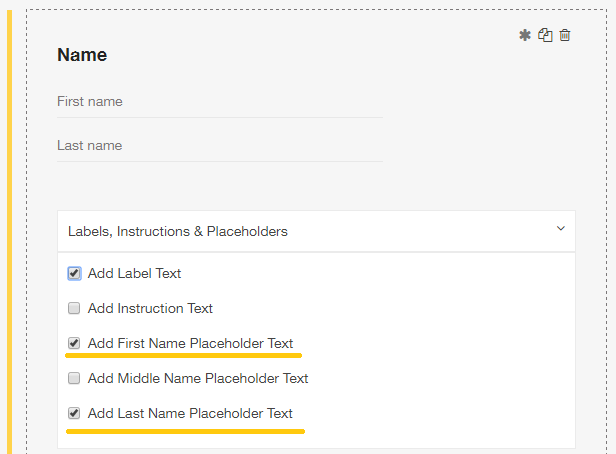 Adding placeholder text to your fields can lessen confusion and make the respondent feel as if they are doing less work. By default, all the text fields in Blitzen form will have some sort of placeholder text. If you do not see any, simply enter into the field and click 'Close me'. To add your own placeholder text, navigate into the desired field, scroll down to find the ‘Labels, Instructions & Placeholder’ dropdown, and check the box that says ‘Add Placeholder Text’. Un-check the box and check it again. Type the text you wish to appear directly into the field.